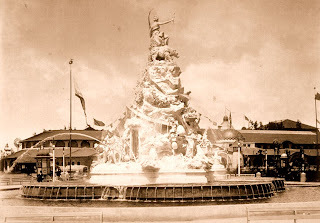 The California Allegorical Fountain stood at the West end of the Midwinter Fair's Court of Honor, directly in front of the Administration Building. 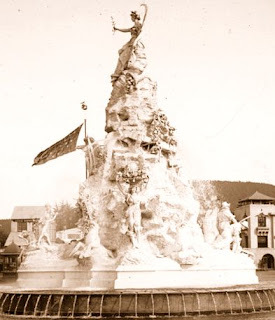 Designed by Rupert Schmid and Marion Wells, the fountain was a 50-foot high mountain-shaped monument, sitting within a 75-foot diameter double basin. Sculptural groups, representing California's mining & wine-making industries, were flanked by statues of the goddesses Flora and Pomona, representing flowers & fruits. Sculpted California sea lions spouted water into the surrounding basin, while a statue of the Goddess Minerva, crowned by a wreath of California poppies, sat proudly atop the mountain. At Minerva's feet, a California Grizzly bear and a fruit-filled cornucopia rose over a panel proclaiming "California - Land of Sunshine, Fruit, and Flowers". Just below the panel, an American Eagle clutched the Great Seal of the State of California. Following the close of the fair, the fountain was removed. 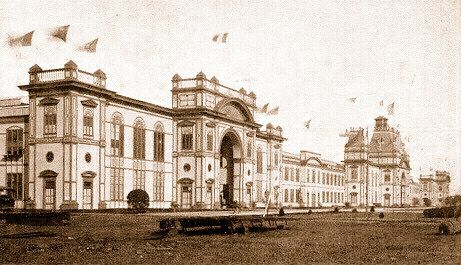 It was replaced in 1900 with the Spreckels Temple of Music, which occupies the site today.